The Seth Green starring film released in theaters earlier this year arrives on Blu-ray 3D, Blu-ray and regular 2D DVD on August 9, 2011. In addition to the home media, the film is available for online download. The film, brought to screen by Disney and Academy Award® winning director Robert Zemeckis, in a producing role, is a film for the humblest of hearts and presented to families alike. The film features grand performances by Family Guy‘s Seth Green, Toy Story‘s Joan Cusack, Kung Fu Panda‘s Dan Fogler and is directed by Simon Wells (The Prince of Egypt). With a cast in crew of utter experience in Animated film, the plot revolves around nine-year-old Milo (Green), who discovers just how great a mother is when she is abducted by Martians who plot to steal his motherly qualities for their own offspring. Milo must venture to save her and do so without hesitation and fear. It appears at first that Milo must brave the dangerous adventure alone, but it is soon discovered he will be aided by unexpected helpers. –Mom-Napping (All-new 3D Exclusive) – An alternate and finished scene in 3D that features a different view of the abduction of Milo’s mother. –Extended Opening – The beginning of the film with additional moment. –Life On Mars: The Full Motion-Capture Experience – Travel behind the scenes and view where the motions and performance of the actors are shot. The film-length, picture-in-picture mode also gives you a chance to hear director Simon Wells and actors Seth Green and Dan Fogler provide an intriguing view into creating the film. -Deleted Scenes with Simon Wells introductions (4 Blu-ray 2D Exclusive Deleted Scenes) – 7 deleted scenes including four that are exclusive to the Blu-ray 2D release. –“Fun With Seth” – View the on-set hi-jinks of actors Seth Green and Dan Fogler as they help entertain the cast and crew. -Martian 101 – With the help of a Martian expert, help learn the language of which the filmmakers invented specifically for the film. With the August 9th release date, the film is expected to be a greatly juiced up experience for families and friends alike. 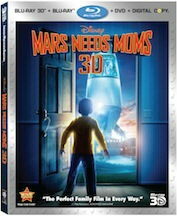 Comments for “Mars Needs Moms” Landing at Home August 2011 are now closed.